Hooray, it's the March school holidays! Since it's the first for my big girl who survived her first term of primary one pretty well, I wanted to make this week special and plan some exciting surprises for the kids. To be honest, I really wanted the kids to be able to try out new things and gain new experiences, so that was my priority when we decided on what to do or which events to attend. 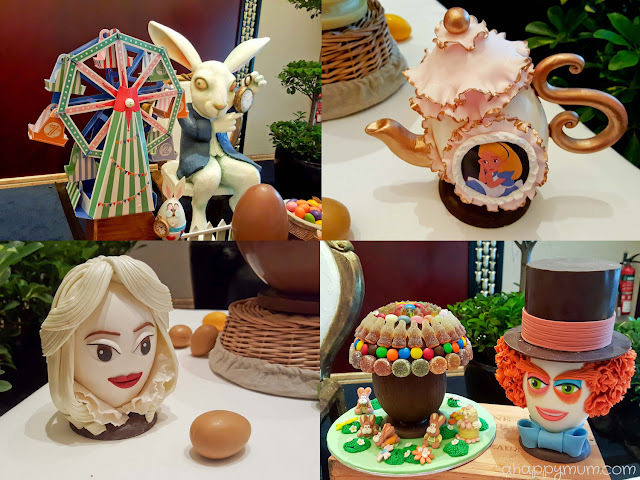 One of the activities we were looking forward to last weekend was the Enchanted Mushroom Workshop - an Easter event themed Alice in Wonderland held by Shangri-La Hotel, Singapore. Sounds egg-citing, right? I mean, what makes a mushroom so enchanted and how is it going to delight the kids? I'll tell you more in this post as well as share with you 5 things we like about this workshop. 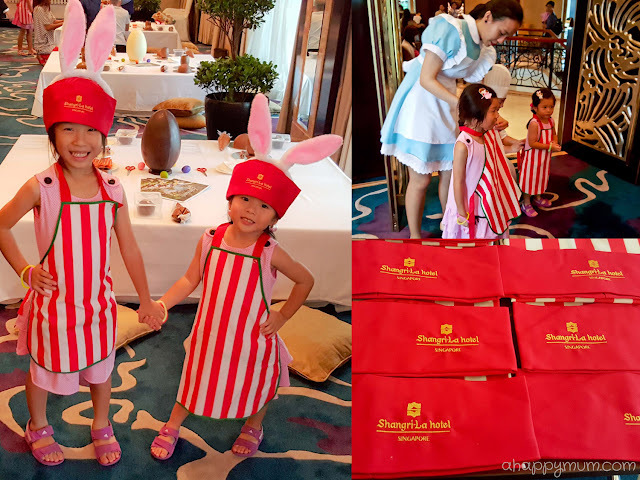 We were one of the first to arrive and the moment we stepped into the Peony Room, the friendly staff greeted us and promptly helped the girls to put on cute little aprons, toques and even bunny ears. My husband commented that the service was what made the difference and he was very appreciative of the kindness shown to us and the little ones throughout the workshop. How do the girls look in the bunny ears, aprons and toques? I love that they were holding hands! Besides giving us a warm welcome, the staff also gave us clear directions on what to do and they even gave one-on-one help with every kid in the room. 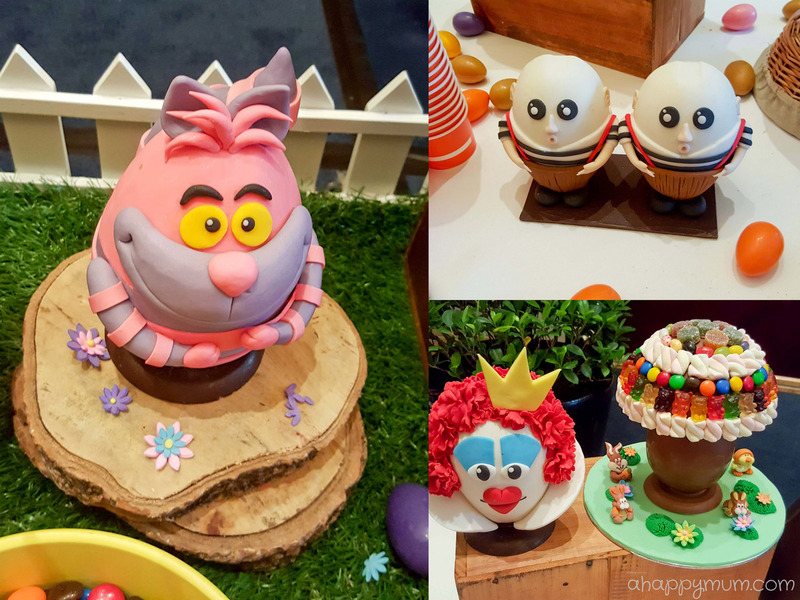 From teaching them to decorate their mushrooms, rolling the fondant grass and piping the chocolate icing, they were there to guide the little ones step by step, with patience, care and affability. That essentially meant that the parents could heave a sigh of relief and be able to relax at a corner while the kids had fun. The stations were clearly divided - there was a grassing station at side, the candy bar was in front and the high tea buffet was laid out at the back of the room. Before we could even figure out what we were supposed to do, one of the chefs came over and said "Would your kids like to come and roll the grass first? There is no one at the station now and they won't have to queue up and wait." That made us very thankful and in the process, she also kindly explained to us on what the kids were supposed to do after that. I was also relieved and happy to see that every kid was assigned plenty of space to work on because I assumed that mine would end up making a big mess. (Yes, they did.) That meant that they could work on their mushrooms individually in comfort without banging of elbows or mixing up of candies. Hello Alice, White Rabbit and Mad Hatter! I simply love that teapot! 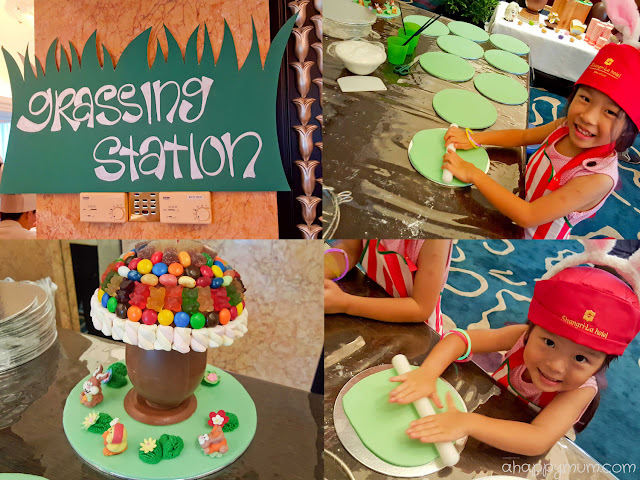 The whole place is a candy paradise and a fantasy come true for the kids! Seriously, I've never seen so much candy before and to sweeten the deal, the kids were free to pick anything they wanted. Yup, you read right. 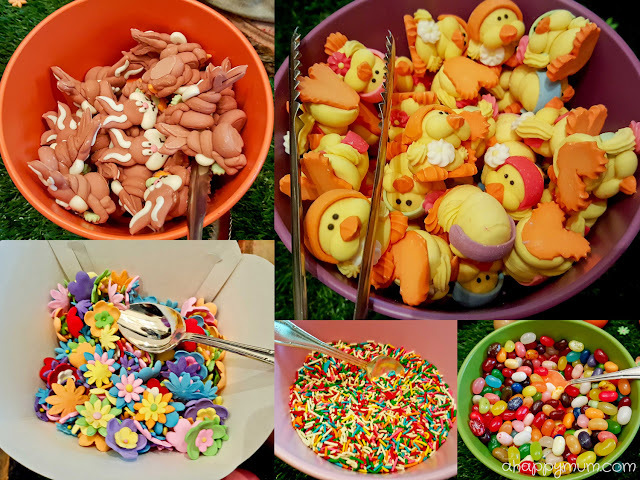 Jellybeans, gummy bears, sprinkles, icing animals, chocolates - whatever and as many as they liked. While I was blown away by the Alice in Wonderland decorations, my kids went straight to the candy bar. Well, which kid wouldn't love it? It's time to go candy shopping! Round 1. Round 2. Round 3. Yes, we can come as many rounds as we like! See what I mean? I think for a moment, the kids forgot that they were in the real world because this was too much like a sweet dream come true. Plus, I'm not sure how many candies they popped into their mouths along the way but it was such a happy day that we decided to close one eye on that. Just for that day. One of my favourite parts was using the cake truffles to roll into balls and then coat them using rainbow sprinkles. The girls did this with care and took time and effort to roll the balls one by one in their cup of sprinkles until they were evenly coated. I must also say that the truffles were surprisingly very yummy even the next day! For the girls, I think what they enjoyed most was being able to decorate their mushrooms in any way they wanted. Each kid will be given a chocolate mushroom dome and a chocolate mushroom base and he/she can decide on how to decorate it using the toppings from the candy bar. How fun, right? I would surely love doing this as a kid and even now! While Ariel needed help for the piping, which acts as glue to hold the candies in place, Angel tried to do everything on her own and even though she made a mess and got all chocolate-y, I was happy that she tried her best. Being the perfectionist that she is, she also took a longer time to decorate her mushroom just the way she wanted it to be. So, what do the parents do when the kids are busy decorating their mushrooms? Well, the good news is that a high tea buffet is served and you get to relax, eat and drink! Now, don't expect the same variety as you will get in Rose Veranda but you will be able to lay your hands on donuts, eclairs, tarts, sandwiches, cupcakes and chicken feuilletes - which were our favourite. I'm not sure if the menu changes at different sessions but I'm pretty certain that what you get will be worthwhile for what you are paying. You can also help yourself to the refreshment corner and for the little ones or those who are not into coffee or tea, there are also soft drinks, juices and milk available too. The entire workshop takes approximately one and a half hours to complete and guests are free to help themselves to the high tea buffet any time. If I said before that I do not view Shangri-La as a family-friendly hotel, our last staycation and this workshop might have just changed my mind. It was a fun and relaxing time for us as we got to sit around, laugh with the girls, bond with the baby, indulge in the high tea and enjoy the simplicity of that weekend afternoon. Here's presenting their final decorated enchanted mushrooms! Woohoo, that's alot of sweets and chocolates, I know! Did we let the kids eat them all up? Of course. Not. The delighted girls with their final creations! Now, while the staff will pack these neatly into containers for you to bring home, you have to find a way to keep them in the fridge. We kept ours at room temperature and the mushrooms started to melt and collapse the next day. Still, we managed to salvage some of our favourite treats to keep in a box and the three of us had a mini candy feast together. 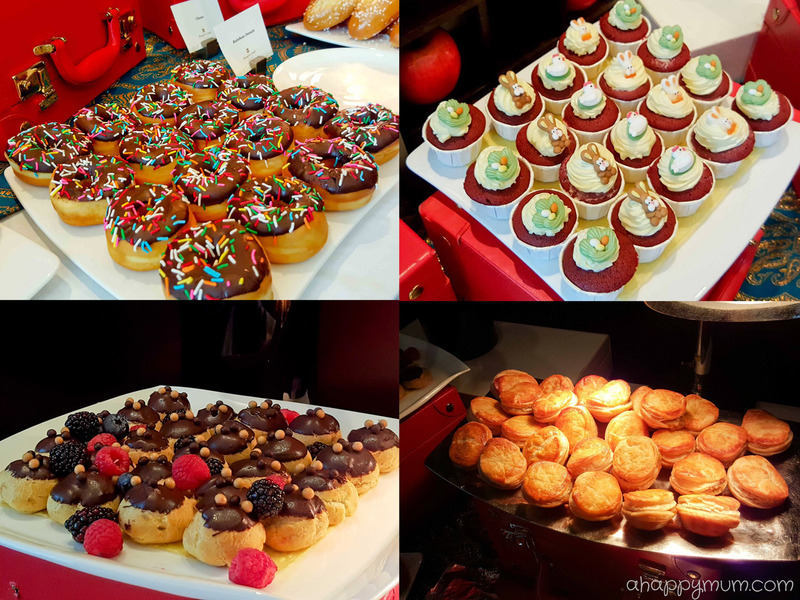 Thank you for giving us a sweet afternoon (and a sugar rush)! After all, it's not about how pretty the end product is or how yummy the treats are; it's about having fun in the process and creating memories to last for a lifetime. For one, I'll definitely this sweet day for a long time to come! Create your very own edible masterpiece at the Enchanted Mushroom Workshop conducted by Area Executive Pastry Chef Hervé Potus. Parents and children are invited to create their own enchanted chocolate mushrooms filled with sweet treats and topped with edible frosting and decorations. 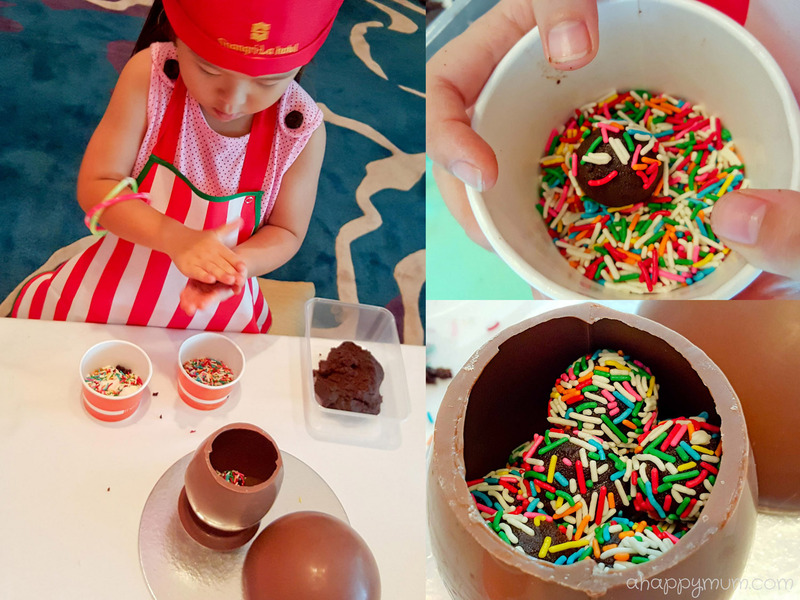 As a memento of their time in Wonderland, each child may bring home their completed masterpiece with a mini chef’s toque and apron. The offer will be available from 3pm to 5pm on 19, 20, 26 and 27 March 2016. 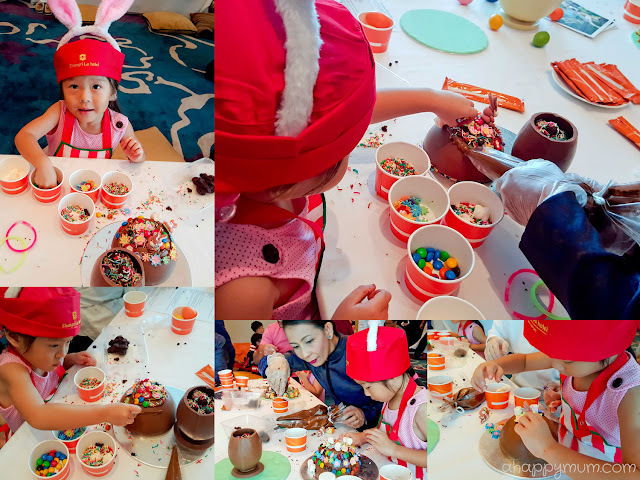 The workshop is priced at SGD88 nett per child accompanied by two parents and includes a high tea buffet. Price is inclusive of 10% service charge and 7% GST. To sign up, fill up this form here and email to dining.sls@shangri-la. 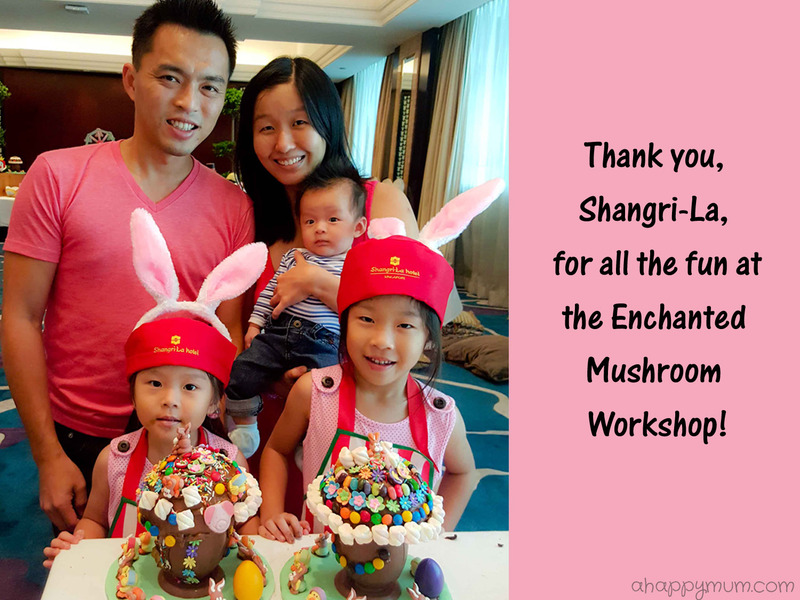 Disclosure: We were invited to the media preview of Enchanted Mushroom Workshop at Shangri-La Hotel. All opinions and pictures are our own.